Here we are in December already! Tis the season of gatherings of family and friends, cooking, baking, gift buying and giving and if you don’t plan ahead it can feel overwhelming and exhausting in December. I have to decorate my own home before doing any clients otherwise I would never have the “Christmas Spirit” left in me to do my own. 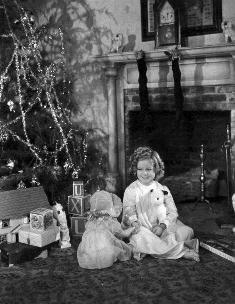 In order not to dread the season, I began to reassess what was important and how to recapture that feeling of the magic of Christmas that one remembers as a child. The smell of Christmas boughs evokes many childhood memories for me. We would go get a fresh tree and decorating it was a day to look forward to like no other. One year my father and I went into the woods near our home and cut down some tree branches to make our own manger for under the tree. That manger, built in the early 60’s still exists in the family and reminds us all of Christmas pasts. Figure out what your favorite traditions are and don’t be concern about some of the extras as those are the items that keep you up at night and aren’t worth the hassle. For the past few years several girlfriends and I do an ornament exchange and we ask our guests to donate as well to one of our favorite non-profits The Children’s Advocacy Center of Collin County. We all have such a great time and collect several thousand dollars for the charity! So keep that in mind when planning a party to give to worthy organizations. Christmas gives us all a chance to invite and share. When planning your holidays you often don’t realize that you are planting family traditions in your family. I lived on Lake Huron in Canada in a small town and for years we would plan and organize cookie exchanges, hay rides singing Christmas carols and visiting neighbors along the way, having tree decorating parties and enjoying all our family and friends. After Christmas Eve Mass we would have everyone back to our house and serve brunch and open gift because it became our tradition! One of the favorite dishes everyone enjoyed was Breakfast Pizza. These are made ahead with hash brown potatoes and some Christmas Cheer. Save some of the peppers to garnish. In a large skillet, combine sausage and onion. Cook over medium-high heat, stirring frequently, for 4-6 minutes or until sausage is browned and crumbly. Drain sausage mixture. Reduce heat to medium-low. Return sausage mixture to skillet. Add cream cheese to skillet. Cook for 4-5 minutes until cream cheese is melted and combined with sausage. Stir in bell peppers. Spread on split English muffin halves. Cover, and refrigerate overnight. Preheat oven to 350 degrees and bake for 15 minutes. Enjoy! Our favorite American holiday is just around the corner and with it comes the colors of autumn to herald in the start of the holiday season. 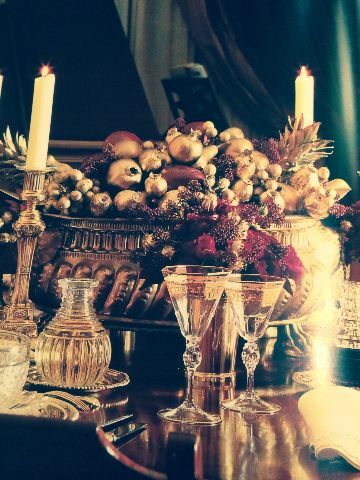 The burnished golds, oranges and fiery reds associated with autumn create a welcoming backdrop to a traditional meal. Sun-drenched hues of yellow and red also happen to stimulate the appetite and they are naturals not only at big feasts but also at family gatherings throughout the year. 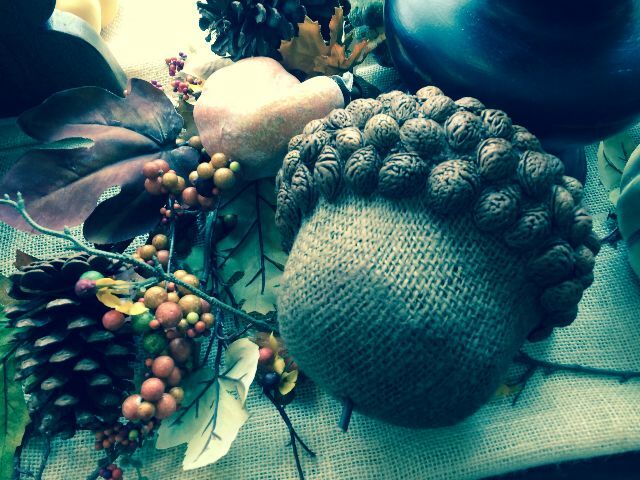 When we grace our Thanksgiving table with these colors, it conjures up bounty and fulfillment. 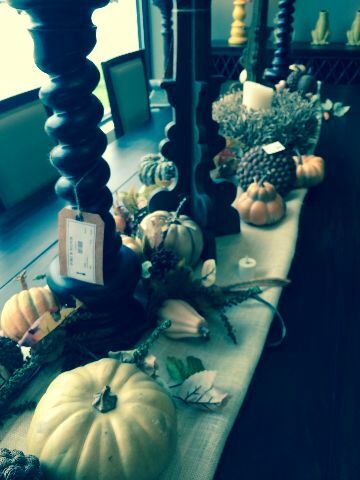 This happens to be my favorite season and the one I most enjoy to decorate clients homes. Fallen leaves, a basket of apples, bittersweet, grapes, Bartlett pears, ornamental kale with assorted pumpkins is nature’s way of taking the guesswork out of autumn decorating. The colors and textures are a delight to the eye. One of the most iconic and enduring images of home is that of the whole family gathered around a table, laughing and chatting while tucking into a lovingly prepared meal. Setting your table for the Thanksgiving holiday obviously takes its cues from fall colors, but thoughtful decorative touches make this a special celebration. Bread feeds the body but flowers feed the soul and that is why we all have a relationship with our favorite flowers. I enjoy doing floral arranging and this is such a fun season to make a beautiful statement on your table. I believe that flowers look much more appealing when they don’t look arranged but rather displayed in a manner that respects their inherent beauty. Be creative with your containers. I look at everything as a potential vase. In fact I once did a party for the NHL and put an arrangement in the Stanley Cup. Not for long I might add just for a quick photo, but couldn’t resist. Have a safe and wonderful Thanksgiving making memories for a lifetime. The Victoria and Albert Museum, London, is the world’s largest museum of decorative arts and design, housing a permanent collection of over 4.5 million objects. It was founded in 1852 and named after Queen Victoria and Prince Albert.